We are excited to launch the Student Application electronically in the Lawyer Portal as part of our ongoing commitment to going digital. Students who have already applied for their Student-at-Law status are not affected by this change. Principals who have already submitted the Articling Agreement are also not affected. As of April 1, students who apply for Student-at-Law status will do so through the Lawyer Portal. Principals will also be required to complete the Articling Agreement in the Lawyer Portal. Once a student has completed their application process, the Principal will receive an automated email prompting them to complete their Articling Agreement in the Lawyer Portal. For more information, please visit our website or read the User Guide and Frequently Asked Questions . If you have any questions, please contact the Law Society of Alberta by email or by phoning 1.800.661.9003. The Court of Queen’s Bench is organizing a group bar call in Edmonton and Calgary. The Court is interested in providing this service to articling students who do not want to have a private ceremony while maintaining the option of the individual bar call for others. The intention is to begin this initiative this summer. The dates are July 26, 2019 (Edmonton) and August 9, 2019 (Calgary). Chief Justice Moreau will preside over the ceremony in Edmonton and Associate Chief Justice Rooke will preside over the ceremony in Calgary. Bookings for the group bar calls will be available in May. There will be a maximum of 25 students in each city. If you have questions, please email the Court. The Law Society is soliciting expressions of interest from the profession to sit as Law Society nominees on the Alberta Law Foundation Board of Directors. For more information, please view the position description . To apply, please send an email with your expression of interest, along with your resume, to Elizabeth J. Osler , Chief Executive Officer and Executive Director of the Law Society of Alberta by April 11, 2019. The Canadian Bar Association is actively recruiting 32 young Canadian lawyers for internships in human rights, access to justice and law reform positions in 10 countries. The Canadian Lawyers Insurance Association (CLIA) is a reciprocal insurance exchange providing professional liability insurance to lawyers in nine Canadian provinces with its headquarters in Regina, Saskatchewan. CLIA’s nominating committee is seeking candidates for two volunteer board positions opening July 1, 2019. Candidates do not need to be lawyers but should have some of the skills identified in the Skills Matrix. The deadline for applications is April 12, 2019. For more information, visit CLIA's website. 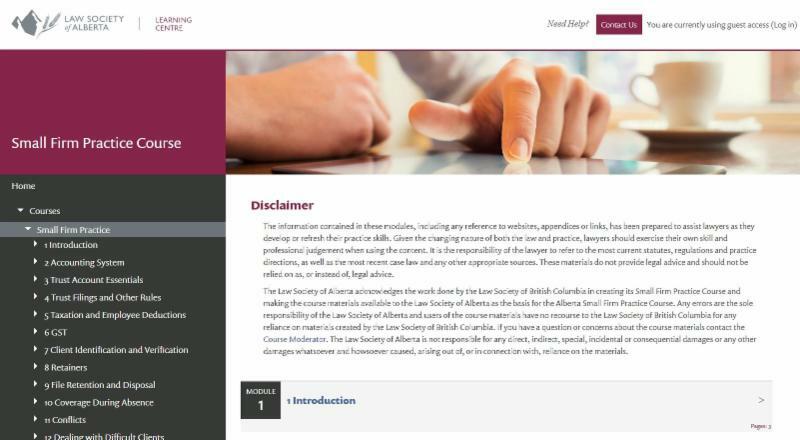 Our Learning Centre is an interactive and informative resource for Alberta lawyers. Our first course is the Small Firm Practice Course. While this course is targeted to sole or small firm practitioners, lawyers of any practice setting are welcome to explore the information and take the quizzes. Designed to be self-paced and self-testing, the Small Firm Practice Course offers modules on key practice areas of interest to sole and small firm practitioners, ranging from practice management to trust accounting to technology issues and various pitfalls of practice. The newest module assists lawyers in identifying difficult clients and learning how to deal with them.